Prediabetes is a clinical condition that occurs just before the onset of type II diabetes. It occurs when your blood sugar rises to extremely high levels, but not high enough to be diagnosed with diabetes. In the United States, no fewer than 57 million persons are affected by prediabetes. Fasting blood sugar has a normal range of 100mg/dL or less. An individual is considered to have prediabetes when his fasting blood sugar level rises up to 126 mg/dL. It suffices to say that prediabetes is marked by a blood sugar level between 100 and 125 mg/dL. Prediabetic patients have a higher risk of coming down with a heart disease. Their risk of developing a heart disease is higher by 50%. On the other hand, fully diagnosed diabetic patients have a two- to four-fold increased risk of heart disease. Prediabetic patients can delay the onset of diabetes or even prevent it by making adequate changes to their diet and lifestyle. More than half of people with prediabetes do develop full-blown Type II diabetes at some point in their lives. Normally, medications are not given to prediabetic patients. Instead, risk factors that may accelerate the onset of diabetes are combated and brought under control. Such factors include a sedentary lifestyle and obesity. Regular exercise and intake of balanced diets are keys to maintaining a good blood sugar level. It is recommended that the patient undergoes a 30-minute non-stop exercise for five days in a week. For those who have lived a sedentary life for a prolonged period of time, they are advised to first consult with their physician before embarking on any exercise program. No specific diet has been recommended or designed for those with prediabetes. However, a diabetes diet is appropriate for individuals affected by prediabetes. The elderly are more at risk of becoming prediabetic. More than 50 percent of those above 65 years of age fall under this category. The most unfortunate thing about it is that most of the patients do not even know that they are prediabetic. Of every six prediabetic individuals, only one knows that he is in a prediabetic state. We need to understand that prediabetes is widespread, we need to know our blood sugar levels, and most importantly, we need to know that there are things we can do to prevent or delay the onset of Type II diabetes. You should agree with me on this, yes! It is time we take prediabetes seriously. It is something that can be impacted on and we should start that right away. It is no longer news that heart disease is the number one killer in America, so if your blood sugar level is up, then you need to do something about it. It is the aim of this audiobook to teach, and educate on prediabetes. 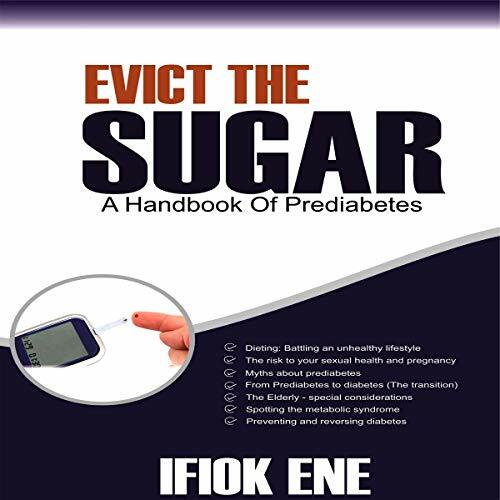 Evict the Sugar is spoken in simple English, with detailed explanation of medical terms to allow for easy comprehension by listeners in the non-medical field.